This traditional stationary chair is a simple and stylish addition to your home. Comfortable with the standard cushion, choose to customize this piece to fit your comfort level with an extra firm cushion or feather soft cushion package. 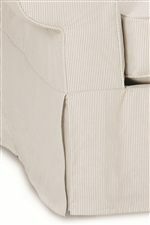 Additional custom options include not only the fabric covering but nailhead trim in either brass or pewter as well as contrasting welt trim or fringe. Create a chair that matches your style and other pieces in the room perfectly with this stationary chair. 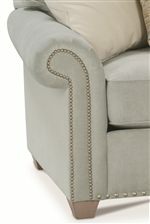 The Morgan Traditional Stationary Chair with Rolled Arms by Rowe at AHFA in the area. Product availability may vary. Contact us for the most current availability on this product.